My lessons suit players of all levels – beginner, intermediate, semi-professional, anyone wanting to improve their playing skills. All styles – folk, pop, rock, blues, soul, funk, jazz, electric or acoustic guitars, ages 9 – 99. Common chord progressions and song structures – great for budding songwriters! Improvisation – anyone can do it! All lessons are 1 hour duration and are taught in English. I normally travel to you for the lessons and teach in the comfort of your own home or office. Alternatively, you can come to me on Wednesday or Thursday afternoons (Paris 15th arrondissement, near metro Charles Michels on line 10) and you’ll pay a little less too. (Please note, I do not teach classical guitar, or children younger than 9 years of age). See here for my prices and booking info. Check out my 5-minute video lessons. You’ll get an idea of my teaching style and some hints and tips that I’ve given to my students over the years. Testimonials from past students are here. LinkedIn members can also view the testimonials in their full original form on my LinkedIn profile. See here for my guitar lesson-related articles and blog posts. If you have any other questions, don’t hesitate to contact me here. I’ll be more than happy to advise you. 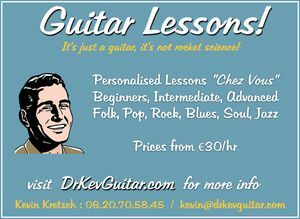 Note that my guitar students also have the benefit of my Guitar Technician services at reduced rates! I can help you keep your guitars in top playing condition, sounding and feeling their best!